FILE - Anas Haqqani, a senior leader of the Haqqani network, arrested by the Afghan Intelligence Service (NDS) in Khost province is seen in this handout picture released October 16, 2014. Afghanistan's Taliban have named a 14-member negotiating team for upcoming peace talks with U.S. special envoy Zalmay Khalilzad. The Taliban's team includes the jailed brother of the head of the powerful Taliban-affiliated Haqqani network. Anas Haqqani was arrested in Bahrain in 2014 and reportedly handed over to Kabul by the United States. He is the younger brother of Sirajuddin Haqqani, who is second-in-command in the Afghan Taliban hierarchy and leads the Haqqani network, considered the deadliest faction of the Afghan Taliban. The office of Afghan President Ashraf Ghani said it had not made a decision to free Anas Haqqani, who was sentenced to death in 2016. Suhail Shaheen, the spokesman for the Taliban's political office in Qatar, said Anas Haqqani was a "student and had no military role," adding that he should be released to help find a "peaceful solution to the conflict." Afghan intelligence agencies, however, believed the younger brother played a crucial role in fundraising in the Gulf countries, through sources the group had developed since the 1980s during its fight against the Soviet Union. In a statement soon after his arrest, the Afghan intelligence agency, the National Directorate for Security or NDS, said Anas Haqqani had "special skills in computers and was considered one of the masterminds of this network in making propaganda through social networks." A few years ago, the Afghan government came under pressure to carry out Anas Haqqani's sentence after deadly blasts hit Kabul. The Taliban at the time issued a strongly worded statement warning of "dire consequences." Adding his name to the 14-member negotiating team may be a way to pressure the Afghan government to release him even as the insurgent group refuses to directly engage with Kabul. At a recent conference on Afghanistan in Moscow, the Taliban met around 50 Afghan politicians and activists. No government representative was invited to the event. The Taliban have refused to meet with government officials. The Taliban negotiating team will meet the U.S. team led by Khalilzad, the special representative for Afghanistan reconciliation, in Doha on February 25. The last meeting between the two sides took place in January and lasted six days. At a recent event at the Washington-based United States Institute of Peace, Khalilzad said the two sides had agreed in principle on two issues: Afghan soil would not be used for terrorism by any individual or group, and international forces would withdraw from Afghanistan. 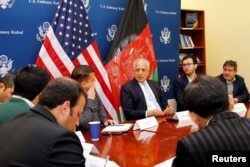 Khalilzad reiterated, however, that the agreement was dependent on a comprehensive agreement on other issues, including a cease-fire and inclusion of the Afghan government in peace talks. "Nothing is agreed to until everything is agreed to," he said. The U.S. special envoy also said that while the timing of a peace deal was uncertain, from his point of view, "we would prefer to see an agreement before July," which is when Afghanistan is scheduled to have a presidential election. Khalilzad is already on a six-nation trip, with a stopover in Belgium to brief the European Union and NATO on negotiations, before arriving in the region.